The Fanuc 200iD/4S Robot Integration to Amatrol Mechatronics (87-500F) allows customers to use a FANUC industrial robot with Amatrol’s 870-series mechatronics stations. This package contains a module enclosure that includes PLC and FANUC interface cables along with a customized program to integrate a customer-supplied FANUC robot with the mechatronics system. Additional features include customized gripper tooling and a safety guard assembly to protect learners. The ability to integrate an industrial robot into Amatrol’s Mechatronic Learning Systems creates an unmatched training opportunity for learners. Using industry standard components, Amatrol’s 870-series teaches a broad array of job-ready skills in integrated technologies across a balance of areas, including mechanical, electrical, electronics, fluid power, and programming. 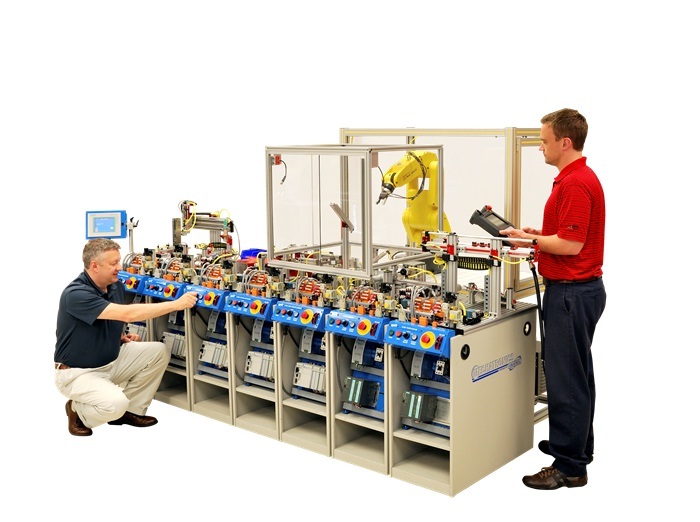 With the addition of a FANUC robot, no other mechatronics system offers this level of real-world applications.